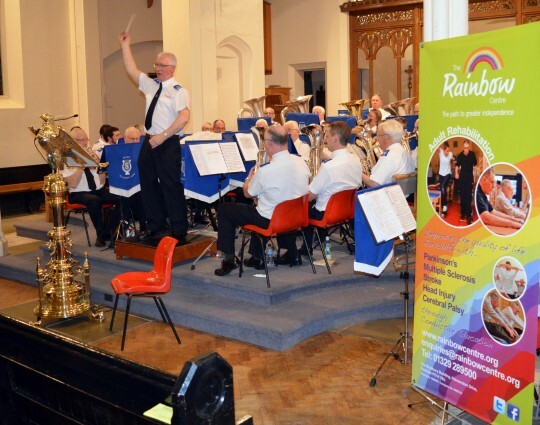 On Friday, 27 February 2015, the Solent Fellowship Band (Bandmaster John Bird) presented a charity concert on behalf of the Rainbow Centre at the Holy Trinity Church, Fareham. The band was honored that Nigel Atkinson Esq., Her Majesty’s Lord-Lieutenant for Hampshire, together with his wife, Christine, were in attendance. The Lord-Lieutenant and his wife are patrons of the Rainbow Centre. The concert commenced with a march, Come, Follow the Band from the musical Barnum (Cy Coleman, arr. Dan Price), then, in contrast, a traditional Maori melody, Hine e Hine (arr. Peter Graham). Following a welcome from Lara Bull, director of the Rainbow Centre, further items from the band included Tritsch-Tratsch (Johann Strauss, arr. Alan Fernie), Breezin’ Down Broadway (arr. Goff Richards) and Cortege from Mlada (Nicolai Rimsky-Korsakov, arr. Gordon Langford). The last was conducted by Assistant Conductor David Samuels. Two of the band’s soloists were featured during the concert. Principal tenor horn Callam Carter played Derek Jordan’s arrangement of the Rondo from Mozart’s fourth horn concerto. Dan Redhead, principal euphonium, presented A Starry Crown (Brindley Boon). Also, the trombone section was featured in A Pilgrim-Prayer (Tchaikovsky, arr. Ray Steadman-Allen). Following an appeal by Jessica Greenwood, community fundraiser for the Rainbow Centre, the band concluded the first half of the concert with The Liberty Bell (John Philip Sousa). After the interval, the second half started with Jubilation! (James Curnow). David Samuels then led the band in Kenneth Downie’s arrangement of Myfanwy. Included in a time of reflection were words from Scripture and comments by Trevor Dawson, the band song When Jesus Looked o’er Galilee (Catherine Baird/Ernest Fewster, arr. Leslie Condon), and the band item Angels Watching Over Me (arr. Joy Webb, trans. Ray Steadman-Allen). The concert generated over £550 for the work of the Rainbow Centre and Lara Bull expressed her appreciation for the evening’s activities. Following The Radetsky March (Johann Strauss, arr. Pat Ryan) the band presented, as a benediction, A Gaelic Blessing (John Rutter, arr. Ray Steadman-Allen). Finally, Bandmaster Bird, who had introduced each item to an appreciative audience, concluded the concert with the Finale from the William Tell Overture (Rossini, arr. Dean Goffin. This article was posted in News and tagged benefit, Callam Carter, Christine Atkinson, concert, Dan Redhead, David Samuels, Fareham, Jessica Greenwood, John Bird, Lara Bull, Nigel Atkinson, Rainbow Centre, Solent Fellowship Band, Trevor Dawson on 5 May 2015 .